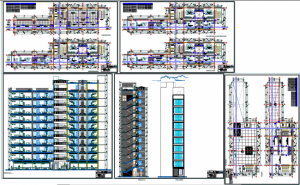 Corporate office building architecture design and detail in autocad dwg files. Thats 10 floor Office building include 500 sq ft to 1200 Sq ft office space thats planning based on modern concept. Include this drawing presentations plan, working plan, sections, elevations, and constructions detail of Office building.